The past few months we have been doing a major kitchen over-haul and I love, love, love the way it is turning out. Combine the kitchen redo with my massive love-hate relationship with the KonMari method of organizing that I adopted last fall and I have been very busy. Yes, KonMari is the crazy method of basically throwing everything away that doesn’t “spark joy”. It comes from the book the Life-Changing Magic of Tidying Up and let me tell you, the process is most definitely life changing. All of these things lead me to today’s solution for how to organize your measuring cups and spoons. While I waited on those to arrive via Amazon I went ahead and ditched all the ugly plastic ones that were old and gross. I thought about designing a much smaller conversion chart. Thankfully I happen to look on Etsy and that problem was solved for me at the ShopArtsyFartsy. Applied the contact paper to the back of the door following the instructions on the package. After the sticks were dry I measured how far apart the cup holders needed to be placed to be even. I used a nail and hammer to start the hole to screw each hook in–you can only screw them about half way in for the stick to mount on the cabinet. I measured where the cups could go and still have the door close. This took a little bit of playing around. Once I was sure of the placement I went ahead and put the command refill strips on the outside of the indent over the black paper. and stuck the sticks on. Next step was hanging everything and double checking door still closed. Lastly I used a silver sharpie to write the measurements above. You could also use chalk or make vinyl labels with a cricut or label maker. 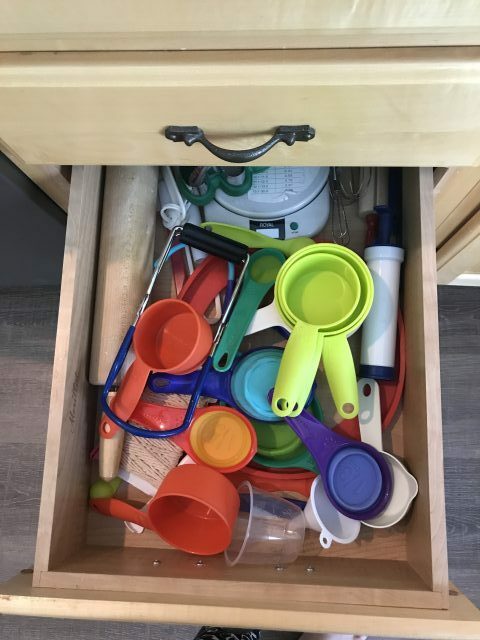 The whole project took less than an hour and using this way to organize my measuring cups and spoons certainly sparks joy for me. I love this and am getting this book asap! The book really is life changing if you let it be. I love this! 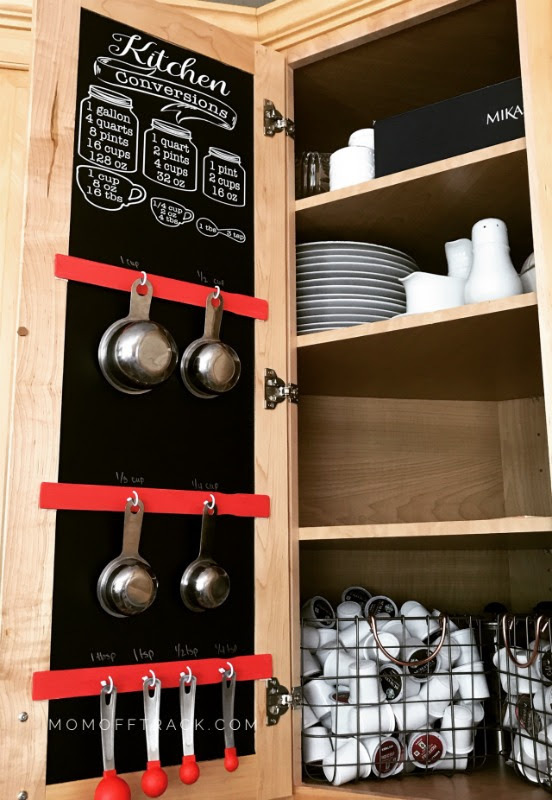 I just installed new cabinets too and I’ve been struggling to figure out how to organize everything in the new space, which is how I cam across your blog. I love that this is so easy to do and yet such a good way to store measuring cups! My old set does’t have a hole in them to hang from, but I think it’s time to get new ones, especially because I’m missing the 1/3 cup, haha! I’m going to have to do this asap!